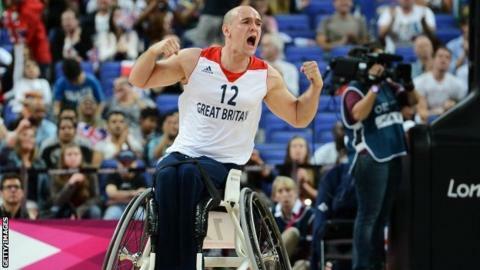 The Great Britain men's wheelchair basketball team reached the Paralympic semi-finals after a thrilling 75-70 victory over Turkey. The GB team, bronze medallists in Beijing, led 71-62 with two minutes to go but Turkey scored eight points in a row to cut the lead to a single point with 20 seconds left. But Terry Bywater hit four late free throws to edge the Bulldogs to victory. They will face Beijing runners-up Canada in Thursday's semi-final. Coach Murray Treseder hailed Bywater's composure in the latter stages as he top-scored on 23 points, with Ian Sagar on 18. "They tried coming back with the fouls but Terry is a true professional and that's why he is the leading all-time free throw percentage shooter in the Paralympics Games," said the Australian. "The ball's in good hands with him at that stage. "I was very, very pleased, it's a hell of a win. We are certainly getting better and better as this tournament goes on." Defending champions Australia will meet the US in the other semi-final.